Two of the kiddos lost teeth last week. That means that the Tooth Fairy was forced to visit our house twice. Yep. Twice in ONE WEEK. I'm thinking that the Tooth Fairy was getting a little bored with the old "leave the tooth under your pillow" bit - even though we had very cute tooth pillows to keep those teeth in. Let me tell you why. One of my kiddos had heard a rumor that if you put your lost tooth in a glass of water and left it by your bed, the Tooth Fairy would magically change the water. He heard that the Tooth Fairy would turn the water a different color. This idea was intriguing. So when we had two kiddos lose teeth in one week, we thought we'd see what the Tooth Fairy would do if we left those teeth in a glass of water. At our house the Tooth Fairy didn't change the color of the water...she actually made the water glitter. It was soooo magical!! But since this mama was much too tired late at night to take photos of the actual Tooth-Fairy-Glittered-Water, I recreated it for you above. I just took two different colors of very fine glitter (in this case pink and blue) and shook it lightly on top of the water. It rested in a fine layer right on top of the water. Very magical. 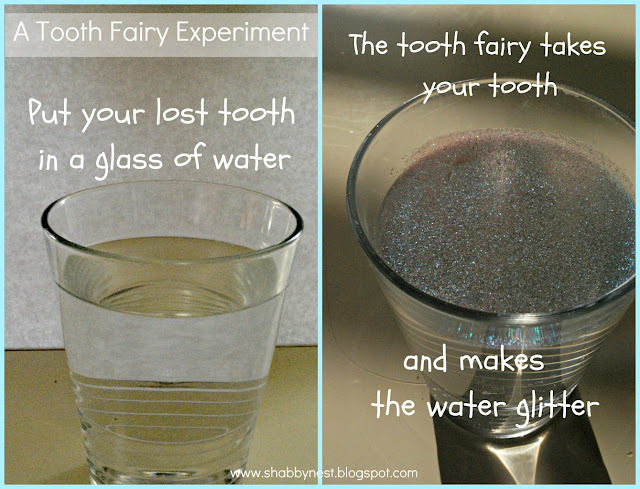 Imagine my surprise when my version of the glittered water looked exactly like the Tooth Fairy's! Even though her glitter was obviously magical...and mine is just the good old craft store version. I'm thinking if the Tooth Fairy left coins...she could have put those right in the water...but at our house she left crisp dollar bills. She must be really strong (or bigger than I think she is) because she was able to put them underneath the glitter-water-glasses. So we decided that from now on we are going to put our lost teeth in water. You never know, that Tooth Fairy might come up with another magical way to make that water change. I guess we'll have to wait and see. Growing up our tooth fairy allows left coins in a juice glass filled with water... and apparently when Grandma came to visit the Tooth Fairy was rolling in coins because the juice glass was FILLED almost to the top with coins!! Our boys put their teeth in a small wooden "jar" for the tooth fairy... just big enough for 10 dimes. :) Do you know what is truly sad? I just found a tooth in said jar last week.... which means the Tooth Fairy is, oh about 4 months late... oops! I love this idea. I think the kids would love it too. 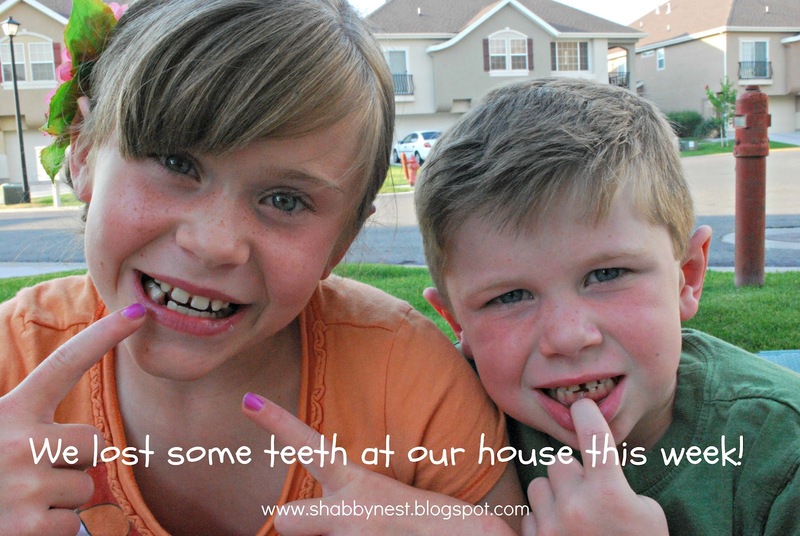 What a brilliant idea, I think we'll need to have a word with our tooth fairy! such a cute idea! love this! I can't wait until my kids are big enough for the tooth fairy. What a clever idea!